Due to the probability of ice and snow this weekend, we have postponed the cRc Christmas party until Saturday December 15th at 7PM at Mastertech. Same everything except a new date. The Norman Christmas Prade has also been postponed until the evening of the 15th. Information about the December 15th Norman Christmas Parade. This year, the parade planners decided to limit the number of cars to a total of 12. Two groups of 6 each. The cRc will pay the $60 for the parade entry for the cars, however since the space is SEVERELY LIMITED, you MUST get your name on the list. We will take a couple of standby cars, just in case someone if forced to cancel. THIS YEAR EVERY VEHICLE IN THE PARADE MUST BE DECORATED WITH SOME FORM OF FESTIVE CHRISTMAS LIGHTING, according to the norman transcript. Information about the 2018 cRc fabulous Christmas party. WHO: Any member of the cRc and their family is welcome to join us for this evening of fun and surprises. If you wish to bring guests, please let us know in advance for seating and food purposes. We will have a guest table this year as our party is most enjoyable. 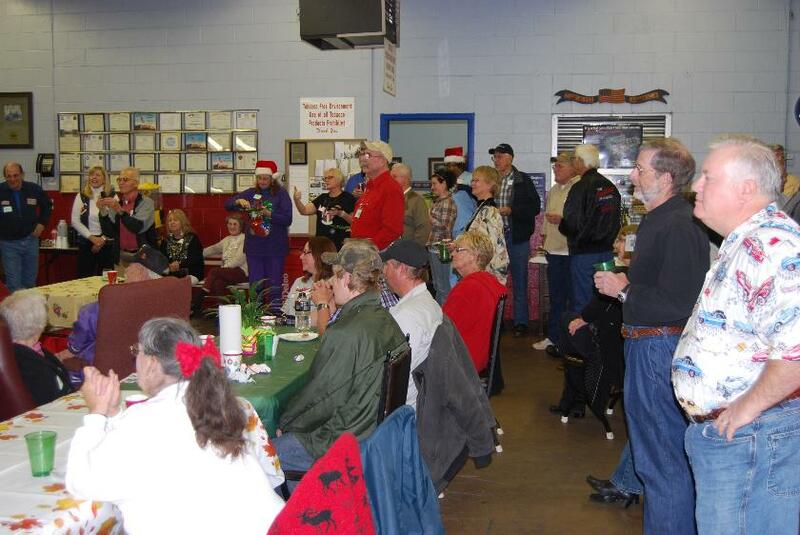 WHAT: The most unique Christmas party you will ever attend....the club provides the main course(s) of oven roast turkey breast and brisket , cornbread dressing and gravy, cranberry sauce, and the members provide the salads, veggies, and yummy desserts. We are even planning a vegan section for whose who wish. WHERE: Mastertech Automotive on SATURDAY, DECEMBER 15th, arrival and visiting begin at 7:00....serving line starts about 7:30 this year to accommodate the later start of the Norman parade. Entertainment that will surely make your evening one to remember. cRc member Dan Haggerty will play his banjo in the accompaniment of noted guitarist Bob French in a selection of lively songs and then last year's wonderful opera singer Rachel Snapp will close things out with a couple of Christmas songs and finally lead us all in "We wish you a Merry Christmas. If you missed Rachel's beautiful voice last year.......well, you missed a lot! MASTERTECH is located on 24th Ave, just across 24th from the east end of Hobby Lobby.....plenty of parking in their lot. Enter from the north side of the building. - meet and greet, set up food on the world's cleanest car alignment rack / buffet table. Desserts go over on Scot's workbench for later consumption. 7:30PM + or - serving line begins: the cRc will provide brisket, roast turkey, gravy and dressing, dinner rolls, and cranberry sauce.......a variety of soft drinks will be provided. Club members will provide everything else. About 8:15 our entertainment will begin.